The massive 1926 Hudson Seven-passenger Sedan weighed 1 375 kilos (3685 lbs. ), rode a 3 225.8 millimetre (127-inch) wheelbase and sold for USD$1,825 f.o.b. Detroit. Many a car company got its start with brothers behind the corporate wheel. Hudson was different; it had a trio of midwives present for its birth. Roy D. Chapin believed in the concept, Howard E. Coffin was the engineer behind the product and Joseph L. Hudson of Detroit department store fame put up $90,000 of personal money for the project. Chapin and Coffin had earned the mercantile magnate's confidence because of their experience in the automobile world while working at the Olds Motor Works in Lansing, Michigan. Hudson set up manufacture in Detroit, in a factory abandoned by the now recently defunct Aerocar Motor Company. The first Hudson rolled off the line on July 3rd, 1909 and was designated as a 1910 model. The brassy, classy and sassy roadster was a good seller. The sturdy Hudson 20 Roadster rode a 2 540 millimetre (100-inch) wheelbase and cost only $75 more than a Ford, which also had four cylinders. The “20” designation stood for the 20 horsepower that the engine rated. Hudson boasted lightweight, all-aluminum bodies in 1926. 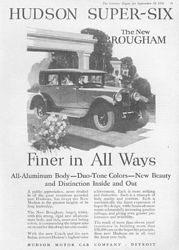 The Hudson triumverate maintained a good friendship with Hugh Chalmers of the Chalmers-Detroit automobile company. Chalmers held shares in Hudson and the men of Hudson owned shares in Chalmers’ concern. This personal and professional friendship made it possible to market the new Hudson across the country in Chalmers-Detroit outlets. Hudson was the perfect compliment to the Chalmers-Detroit line as it was smaller, lighter and less expensive. The Hudson 20 Roadster sold for $900. The dual company arrangement didn’t last a whole year as it was simply too unwieldy to administrate. So in gentlemanly fashion stocks were swapped and personnel permanently assigned to one company or the other. A new Hudson factory was built on the corner of Jefferson and Conner Avenue and opened its doors in October of 1910. Hudson would be first class even with its factory. The industrial complex was created by none other than industrial designer guru Albert Kahn with floorspace that was nearly 76,200 metres (250,000 feet). Prosperity would fill it fast. The new company sold 4,566 units in its first year, giving it 11th place in the sales race. That figure was an astonishing success for a newcomer to the field. The next year things got even better, Hudson would own the lucky 7th spot in the industry. The 1911 year saw the introduction of the Mile-a-Minute guarantee for the Model 33 Roadster. 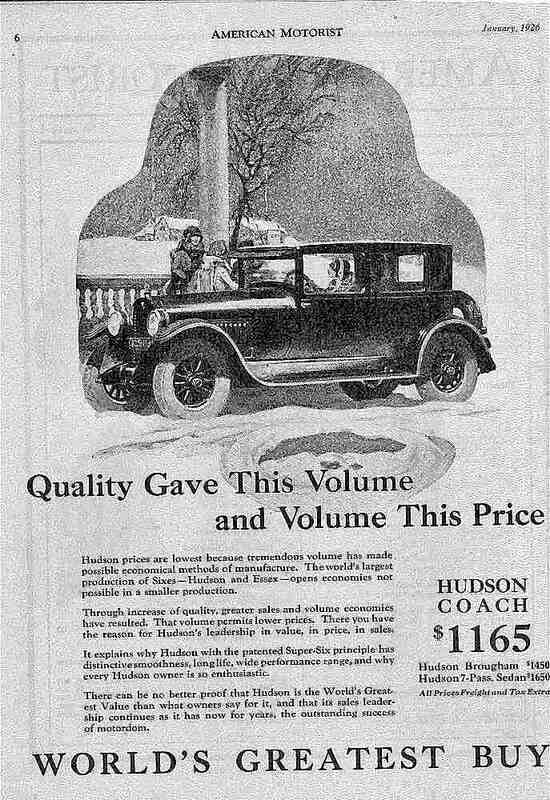 This was an incredible promise considering the poor road conditions of the era, but Hudson was confident of its product. In 1912 founder Joseph L. Hudson died. The company continued to prosper, however. In 1913 sales were boosted tremendously with the introduction of time payments or the buying of consumer goods on a monthly installment plan. 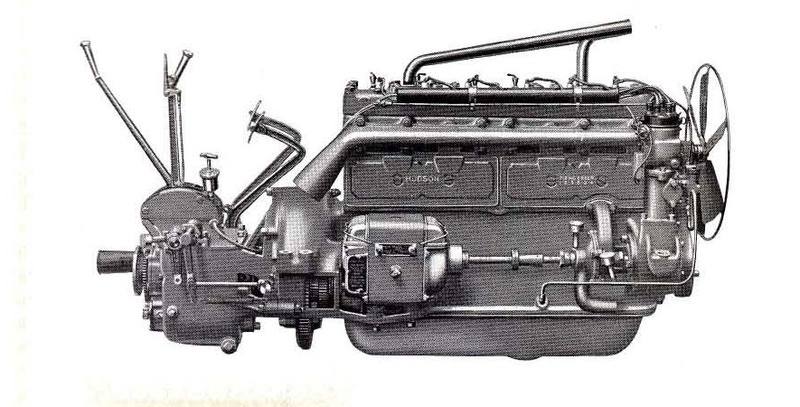 Introduction of Hudson’s first six-cylinder engine was big news for Hudson. The big powerplant was a hit with the buying public; by 1914 the French-inspired, Renault-type four-banger was history. The 1914 Hudson line bowed with six-cylinder engines. Hudson management is credited for bringing the six-cylinder engine to moderately priced cars. Previously, six-cylinder power plants had been the exclusive domain of luxury vehicles, most often European. 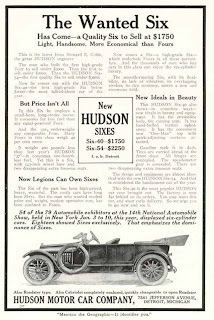 Advertising began to bill Hudson as “The world’s largest manufacturers of six-cylinder automobiles.” The new engine design was an L-head configuration. Cylinders were cast in two sets of three with the motor was rated at 40 horsepower. The Super Six engine version shown here powered three Hudsons at the Indianapolis 500 in 1919. The Hudson Super-Six made its debut in 1916 and set speed and endurance records that stood for many years. 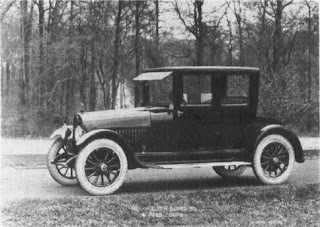 Closed car production was also introduced that year and the modestly priced Essex bowed as Hudson’s companion car in 1918. In 1919 Hudsons raced at the prestigious Indianapolis 500 and finished respectably, earning 8th, 9th and 14th places. 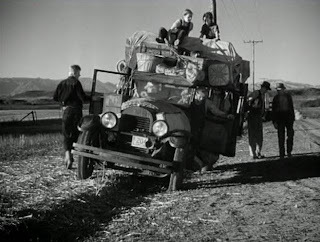 A 1926 Hudson starred in The Grapes of Wrath, the Oscar-winning 1940 Hollywood film. Roy Chapin was a fervent believer in good roads. Good cars needed good highways upon which to drive. 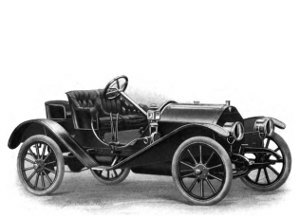 Chapin had piloted an Oldsmobile from Detroit to New York City at the turn of the century to prove that it could be done. Now he championed the cause of roadbuilding. Chapin was named chairman of the Good Roads Committee of the National Chamber of Commerce, Vice-President of the Lincoln Highway Association and President of the Michigan Good Roads Association. 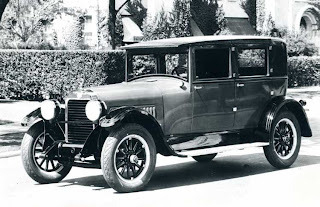 In 1921 Hudson pioneered the closed-in coach and the company continued to prosper. Sales were 28,242 units in 1922 and nearly doubled the next year when 46,337 cars were sold. A total of 59,427 Hudsons was delivered in 1924 and a whopping 109,840 cars bearing the famed triangle were sold in 1925. This figure made Hudson the number three automaker behind Ford and Chevrolet. 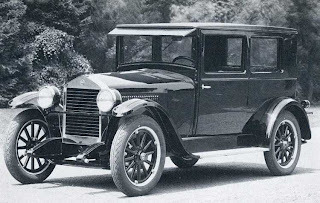 In achieving the number three position, Dodge Brothers was knocked from third to fourth in rank, making Buick and Willys-Overland the number four and five most sold cars in the US, respectively. $3 million was spent for a new body plant which would turn out closed coaches. The new bodies were called “All-Steel Full-Vision.” Concentrating on closed cars, only one open tourer was fielded, primarily for export markets. Hudsons began leaving the factory this year with bumpers (! ), electric windshield wipers, a new tail light and stop light. 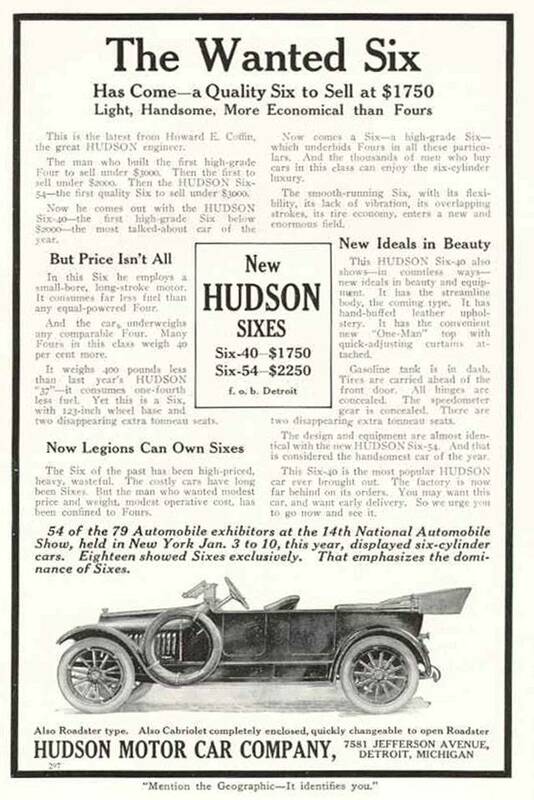 The New York Times paid special tribute to Hudson and Essex with a glowing article, praising the automaker for bringing closed cars to consumers. 1926 Hudson Seven-passenger Phaeton sold for USD$1,2050. The L-head in-line six-cylinder engine had a 4.7-litre (288 cubic-inch) displacement. Mechanical updates included an improved carburetor and intake manifold which advertising claimed would increase gas mileage by 3.2 kilometres (two miles) for each 3.8 litres (one US gallon) consumed. 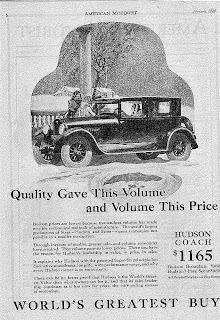 On the downside, a fire damaged the new body plant, putting a damper on production, in 1926, only 70,261 Hudsons were sold—off by 36% from last year-- though with Essex production added in, Hudson slipped only two notches to the 5th position in sales. 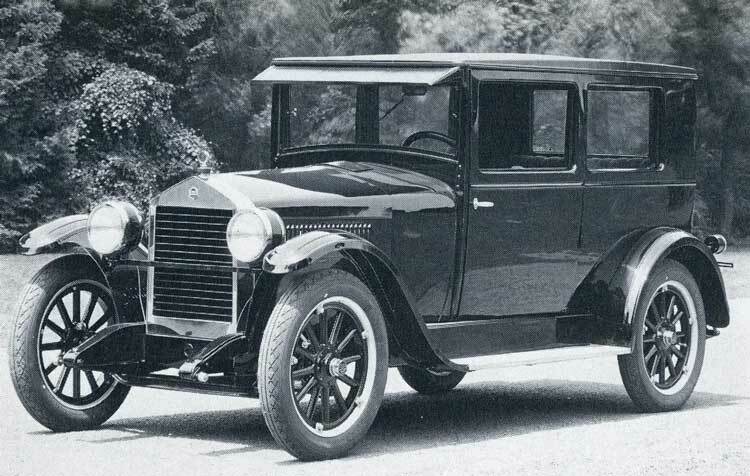 The 1926 Essex was the low-priced companion car in the Hudson stable. Hudson head office dealt with an unusual problem this year. Industry custom dicated that new cars debuted in December and were available at the dealers in January. Hudson officials quietly sent out letters that Second Series cars--which traditionally made their debut in the summer months--could receive the year designation for the following calendar year. The intent was to make the car’s newness appear to last longer when the car was registered. The plan made sense because for the first time the same year designation covered models that carried the same look.